This page has sponsorship info for clubs. See also: Tournament Sponsorships. 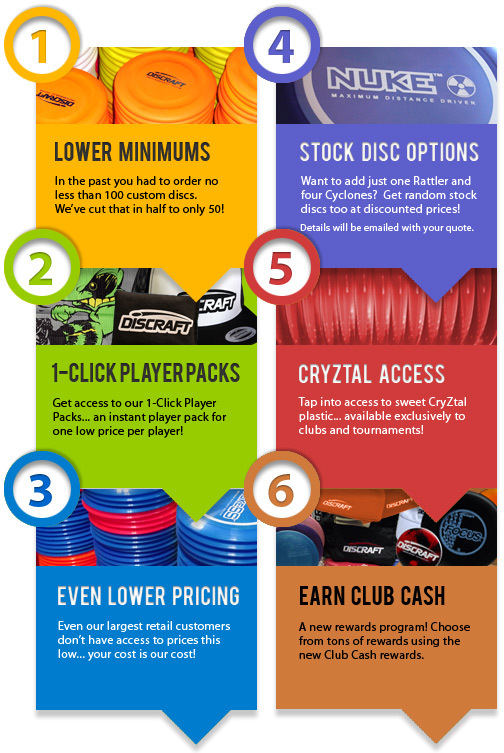 Clubs support disc golf growth, and Discraft supports your efforts! Lower minimums: get as few as 50 custom discs! More models: choose up to 5 disc models... or more! Even LOWER pricing: better than wholesale! Stock disc options: expand your model choices! Mix and match! Access to CryZtal plastic available exclusively to clubs and events! Earn CLUB CASH to exchange for even more swag! This is your year! Build your club spirit with custom stamped golf discs from Discraft. Your members will feel like an important part of something special when they are carrying club plastic! To take advantage of club sponsorship you must place an order for custom club discs. The minimium custom order to qualify is 50 discs with a 10-disc minimum per model. Your club name and the year must be on the stamp to be eligible for this sponsorship. See complete program restrictions below. We'll also waive your art set-up charges to save you another $60. You will also get (on request): a large Discraft event banner, 50 stickers and a box of scorecard pencils... in addition to whatever you choose to spend your Club Cash on. No hidden charges... you'll raise a ton of funds! The only extras you'll pay are shipping, so 50 discs with your custom hot stamp could be as little as $225 plus shipping. Check it out! 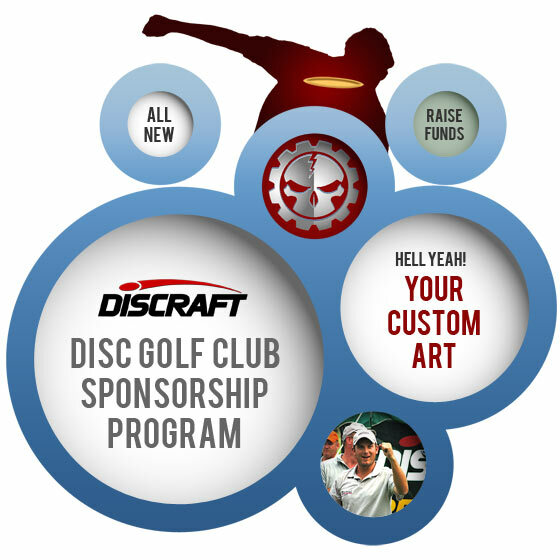 This sponsorship program is for disc golf clubs and leagues. Club name and year must be included in your custom art. Orders attempting to utilize this program for non-clubs will be denied. Minimum custom order is 50 discs. Your order unlocks all additional sponsorship benefits. Maximum stock disc purchase at special Club Sponsorship stock pricing: 100 discs. 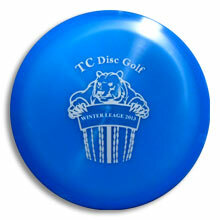 Must be ordered prior to shipment of your custom discs to receive special pricing. Club Cash must be redeemed for official program packages at time of order and may not be combined with other programs or orders. Club Cash has no cash value and expires upon shipment of your custom order. What does Discraft ask in return for sponsorship? 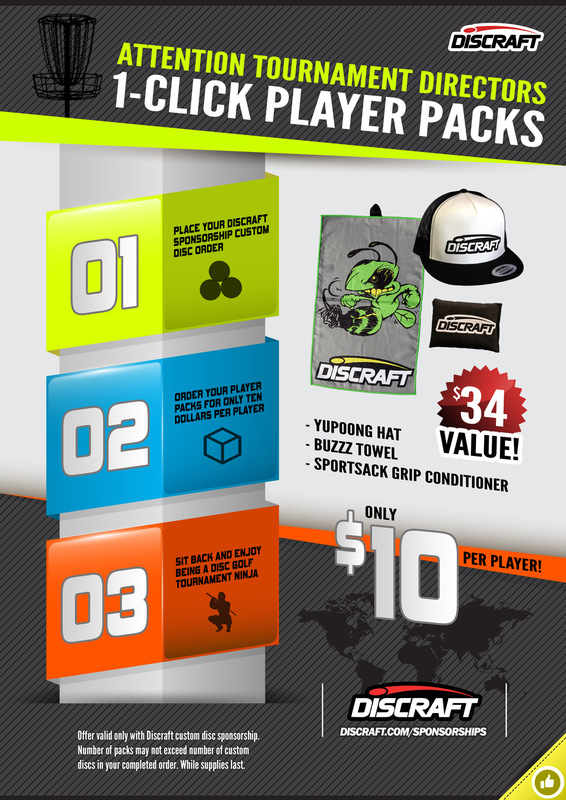 Simply that you promote Discraft as a key sponsor, giving the same promotional consideration as you would any valued tournament sponsor: logo and link on your website, program and fliers, a banner posted during the event, and acknowledgment to your players. Click the logo below for more sizing options. Sending us photos or YouTube vids showing these sponsor support activities can also help you to earn additional Club Cash toward your next event! As you are planning out your custom order, browse Club Cash Rewards store to see what additional items you might like! Need art help? Browse our free design templates that can be customized with your club info.